Note: The previous, and printed, version of this story incorrectly stated that the Keizer City Council approved a text amendment lifting an overlay zone on the properties near the intersection of River Road North and Chemawa Road North. The council voted only to hear a discussion regarding lifting the prohibition. The Keizer City Council cleared the first hurdle that may make way for a gas station in front of the Keizer Safeway location on River Road North. In a 5-1 vote, the council agreed to hear a discussion regarding the prohibition of gas stations, in an area about a block-and-a-half in every direction, around the River Road North and Chemawa Road intersection. Councilor Kim Freeman was absent. While any approval for a gas station remains far off, the approval will allow the city to proceed with talks about adding a Safeway gas station. The prohibition zone predates Keizer’s building codes and was approved in 1996 by city councilors who were concerned about “safety and aesthetics” in the main corridor of Keizer’s downtown. At the time, there was already a gas station on the southwest corner of the intersection (where the focal point is now), and the then-councilors hoped to prevent another from cropping up before discussions could be had about what city leaders wanted the intersection to look like, said Nate Brown, Keizer’s community development director. “There is a lot of specific criteria that has been developed and we’re in a different place. It would be a healthy discussion to have about what we want it to be now,” Brown said. The request allow the discussion was the result of a proposal by Safeway. The proposal offers two sites for potential placements of the eight-pump gas station, either along the north side of the parking lot close to Chemawa Road Northeast or in the southwest corner behind Oregon State Credit Union. The proposal also includes a traffic study, but the numbers were from an older traffic report, a newer one was conducted in 2016. 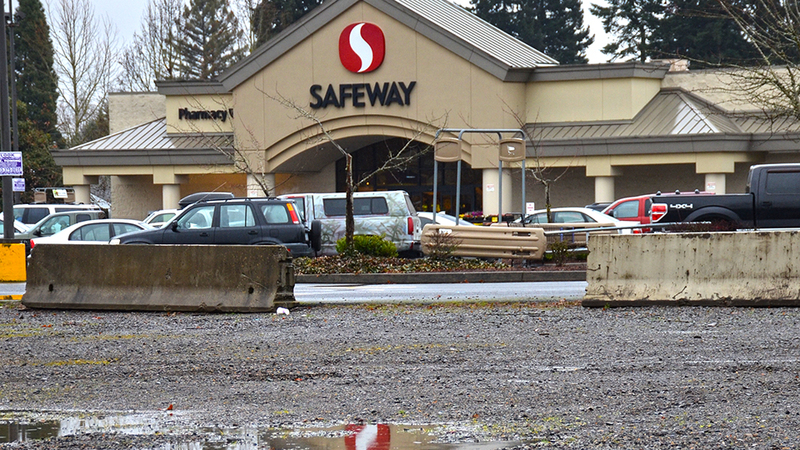 The willingness of Safeway to pay for additional traffic mitigation was one reason Councilor Roland Herrera voiced support for lifting the overlay zone. Mayor Cathy Clark took issue with the out-of-date traffic counts used in the proposal and thought the new counts “would make it hard to work,” but that wasn’t her main objection or reason for casting the sole vote against the change. “My biggest concern goes back to the vision of River Road Renaissance. I’m concerned that if we let go of this vision now, we won’t get it back,” Clark said. The River Road Renaissance plan was drafted in 2009 and set forth a vision of River Road that addressed everything from the look of storefronts to the paths of sidewalks. Even before the plan was finalized, several efforts were made to bring some of the ideas to fruition in the mid-2000s, but the prevailing winds died with onset of The Great Recession. Councilor Amy Ryan suggested the council look forward rather than backward. “The Renaissance vision hasn’t progressed. I don’t see interest in that and I would hate to limit a business that is looking to expand,” Ryan said. The 5-1 vote means the issue will most likely be taken up again at a future meeting of the Keizer Planning Commission. Once planning commissioners craft a recommendation, the council will take it under consideration and hold a public hearing on the matter for the public to voice consent or dissent.